Recently I encountered the famous bug of iOS 12 beta update which all beta tester developers faced. 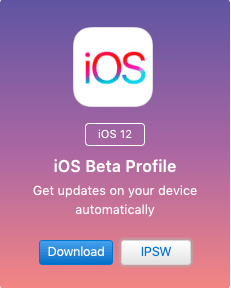 The bug was that the iOS keeps asking you to update your software version to newer beta release (beta 12 as of writing this post) repeatedly. Issues was, I was in africa and didn’t have a stable internet connection here. So the iOS update download was not resuming after network disconnects. I tried downloading it several times on my iphone but it failed everytime with an error. Obviously that was expected as satellite internet over here is not so good. Well the trick is to download it on your computer first and then install it on your iphone. Well, solution is pretty simple. Also, once donwloaded, you can option+update from itunes (pressing option button allows you to select the ipsw file on your computer disk. P.S. you can also download beta profile for your device from that website.